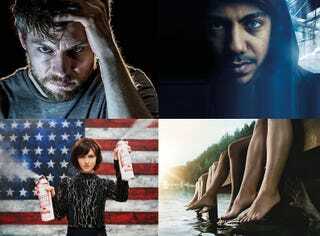 With the recent tv upfronts, there have been lots of pick-ups, renewals and cancellations. Check below for summer premiere dates and info on upcoming shows. Six-episode Australian drama series based on Aboriginal mythology, set in the near future, where creatures known as Hairypeople live among humans as outcasts despite boasting superior physical powers. Follows Kyle Barnes, a young man who has been plagued by possession since he was a child. Now an adult, he embarks on a journey to find answers but what he uncovers could mean the end of life on Earth as we know it. Centers on five Earth teenagers — Keith, Lance, Hunk, Pidge and Shiro — who are thrown into the middle of an intergalactic battle and become the last line of defense for Arus and other planets against an evil alien force led by King Zarkon. A comic-thriller set in the world of Washington, D.C. politics that follows Laurel, a young, fresh-faced Hill staffer who discovers two things: the government has stopped working, and bugs are eating the brains of congress members and Hill staffers. A group of extremely diverse survivors of a plane crash on a remote island who must adjust to life in a dangerous new world that poses unique threats — mostly brought upon themselves. A young man who wakes up from a coma after 12 years and discovers new supernatural abilities that propel him into the middle of a dangerous conspiracy. A reimaging of the 2000 film. it centers on a female police detective (Peyton List) who in 2016 discovers she is able to speak via a ham radio with her estranged father (also a detective) who died in 1996. They forge a new relationship while working together on an unresolved murder case, but unintended consequences of the “butterfly effect” wreak havoc in the present day. Directed by Kazuto Nakazawa, Perfect Bones is set in the future where scientists have tried to create the “perfect human” in hopes of keeping peace in the universe. After nearly achieving their goal through several children, the scientists send their “new humans” for further training where they are kidnapped by an evil organization set on using their powers to implement their own concept of a new world order. Centers on a journalist (Wyatt Cenac) who is investigating a support group for alleged alien abductees. Although he is very skeptical at first, he slowly becomes sympathetic to the stories of the alleged abductees and even starts to suspect he might be an abductee as well. Based on an alternate history novel by Len Deighton, set in a United Kingdom conquered and occupied by Germany during the Second World War. Van Helsing (Syfy) - September? What’s missing? What are you excited about? Leave a comment below.